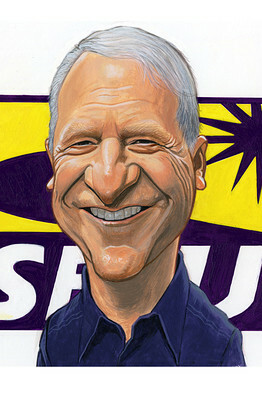 SEIU gangster Andy Stern appointed an operative who was in a "No-show,no work" job at Sacramento county. The Stern gang are now spending millions of dollars with their hacks Regan and Medina implementing a wrecking operation on SEIU UHW. Crooked Stern Appointed Union Operative Fired By L.A. County for failing to return to work: "No-show, no-work" job? Alejandro Stephens, a healthcare marketing representative, had been on a lengthy paid leave arranged by his ex-girlfriend, Annelle Grajeda, a union president who is currently under investigation. Los Angeles County has fired the former head of one of California's biggest labor organizations, accusing him of refusing to return to his government job after a lengthy paid leave arranged by his ex-girlfriend, a union president. Alejandro Stephens had been president of a Service Employees International Union local that represented county workers. He lost his union post in 2007, after the local was merged into a larger one whose president is Annelle Grajeda, his ex-girlfriend. Grajeda, who also is one of the SEIU's highest-ranking national officers, went on leave in August after the union opened an inquiry into whether she abused her position by helping Stephens, a county healthcare marketing representative, remain on the public payroll. She is still on leave, and the internal investigation is continuing, an SEIU spokeswoman said. Stephens, who could not be reached for comment, has appealed his firing through Grajeda's SEIU chapter, Local 721, which represents about 80,000 social workers, nurses, sanitation drivers and other government workers. A civil service hearing is pending. The firing took effect in December, after the county Health Services Department accused Stephens of insubordination for not reporting to work in September. Stephens had been on an eight-month leave for which the local had reimbursed the county, according to the union. In a Dec. 3 letter to Stephens, the health department says that he ignored the return-to-work order, then sought to use vacation time to stay off the job, and obtained a medical excuse for Sept. 10 through Sept. 24. The doctor's note did not cover the period for which he was absent without authorization, the letter says. The local responded with a Dec. 10 letter that says Stephens "categorically denies" the allegations. The documents were obtained recently through the county Civil Service Commission. After Stephens lost his position as president of the old Local 660, he received a severance package from the SEIU that required him to give up his county salary, according to the union. But he remained on the county payroll in 2007, and then went on the leave last year, union and county officials say. The SEIU has demanded that Stephens return most of the money it paid him in 2007, saying he violated the terms of his separation agreement by not forgoing the county salary.